What Will Deadline Day Have In Store For West Ham? The most eagerly awaited day of the football calendar has finally arrived. After 63 days of gossip, speculation and downright made up madness the transfer window finally closes (sorry, slams shut) at 11 pm tonight. Spending has already topped the £1bn mark but with many believing the window is not complete without a last minute deal or two that figure is destined to hit new inflated heights. A number of long running transfer sagas have dominated the window since it opened back in June and so today we may well finally find out what will happen to the likes of Coutinho, Costa, Barkley, Oxlade-Chamberlain, Sanchez and Van Dijk . One thing that we know for certain is that none of the above will be heading down the Jubilee Line to the London Stadium. Whether there will be any more comings and goings at West Ham is a confused picture and subject to contradictory information. Some say that our business is done and we can all go to bed early while others maintain that players from all corners of the globe are making a beeline to the London as we speak; in order to thrash out terms, undergo medicals and ink deals with the Hammers. The apparent pursuit of William Carvalho has kept the West Ham faithful entertained for a few weeks now and, despite being exactly the type of player needed to make us harder to beat, it has the whiff of a token affair about it. A traditional part of every West Ham window has been to target a big name dream signing but to eventually come up short when it gets down to agreeing a fee; tweeting with an air of faux frustration that we had tried our best but failed even after checking down the back of every sofa in Sullivan Mansions for loose change. With seven of last season’s squad having departed and only four new recruits then the squad looks light on quantity as well as the obvious gaps on quality. Throw in a median figure of six or seven out injured at any one time and a reluctance to blood those young players who have yet to be sent out on loan and you might get the impression that there is a self-destruct element to our season’s preparation. At the risk of labouring a point I can’t go along with satisfied self back slapping that has been going on regarding our transfer business. Apart from Javier Hernandez (although even there I remain curious as to how we can support him from our midfield assets) I think we could have done better than the other recruits where proven experience has blinded us to current and future potential. Further confusion has now arisen from the Diafra Sakho situation with the striker seemingly trying to arrange his own transfer back to France. I have to admit to always having liked Sakho as he brings attributes of strength, mobility and defending from the front to forward areas that were otherwise missing. Allegedly he has some attitude issues but he is far from the first to have fallen out with the management. If he does end up staying I wonder what possible use he is going to be. On the other hand relying on Hernandez alone (to score and stay fit) plus a fragile Andy Carroll is as thin as it possibly gets up front. The continuing noise about cliques and favourites at the club is indeed worrying. On the subject of noise, the Manuel Lanzini to Liverpool (as a replacement for Coutinho) refuses to go away. It would be a disaster to lose the team’s only creative player on the last day of the window but I think we need to accept that, even if he stays for now, it is only a matter of time before he is off to seek the brighter lights of European football that he is unlikely to find at West Ham anytime soon. There have been a few new West Ham targets to emerge in the media over the last few days. These include diminutive striker Abdul Majeed Waris from just down the road at Lorient (oh, not the Barry Hearn one!) and a loan deal for Barcelona central midfielder Andre Gomes. My sense is that if there is any business done today then it is more likely to be loans than permanent deals. Maybe a loan for Jack Wilshere could be on the cards. I am always open to a touch of shock and awe in the transfer window and so will not be able to resist sitting by the computer, impatiently refreshing the deadline day news-feeds to see which players have been spotted changing trains at Canning Town or going into a Pie and Mash in the Roman Road with the Sullivan family. If the Board could just see their way clear to bringing in William Carvalho and Moussa Dembele (every club needs a Dembele) then I am prepared to upgrade my transfer window assessment from ‘Slightly Disappointed’ to ‘Quietly Encouraged’. Author Richard BennettPosted on August 30, 2017 August 30, 2017 Categories News4 Comments on Bilic out or Bilic in? Where do the fans stand? Early season expectations, advance of the stats and the time wasting rip-off. Lots of football followers are getting a bit carried away with how their team will fare this season, even though we are just two games into the Premier League campaign. Huddersfield are only the second team to keep clean sheets in their opening two Premier League games following promotion from the Championship. The first team to do so were Charlton in 1998-99. And what happened to Charlton that season? Yes, they were relegated. Hull City had six points after their first two Premier League games last season after promotion. They had beaten champions Leicester in their first game, and then won away at Swansea in their second. Of course, they were relegated at the end of last season. We continue to be bombarded with ever-increasing volumes of statistics in football these days, which may be of some interest, but what do they actually prove? Arsenal had 77% possession of the ball at Stoke last weekend and lost the game 1-0. Does that mean it is better not to have the ball too much? And the latest statistic to come to prominence this season, although it has been around for a while is “expected goals”. I have been reading about this in some detail, and despite quite a liking for statistical analysis (out of interest only), I wonder if this one has been thought through properly. The concept is that they now measure the probability that any given shot will result in a goal. The purpose is to quantify the quality of each chance created, by analysing historical shots (up to one million of them) to assess how the probability of a goal being scored is affected by various factors, such as the distance and angle from the goal, whether the shot was hit by the stronger or weaker foot, or head, the type of assist, and passage of play. Expected goals (given the shorthand xG) for each individual shot can then be added together to arrive at the expected goals for individual players and for teams. So, for example, in the Arsenal game at Stoke last weekend, the Gunners won the “xG” by 1.48 to 0.67. What does this prove? That they were the better team? Just like possession statistics does it really matter? Stoke won the game 1-0. And what about potential flaws in the data? What other factors are not taken into account? The quality of the defenders, does the chance occur at the beginning or end of the game, what is the score at the time, are you under greater or less pressure because of league position, the beginning or end of the season, tiredness. These are just some of the factors that have occurred to me, and I’m sure there are many others. There are so many “human dimensional” factors that will influence what will happen in a game of football, and you have to include “luck” too. Just for interest, in expected goals terms (xG) we lost our opening fixture at Old Trafford 1.93-0.48. Our game at St. Mary’s was a close run thing but we lost that, too, by 2.08-1.96. I’m sure that there are data analysts out there who would prefer the results of matches, and the subsequent league tables to be based on expected goals rather than actual goals! On a lesser scale, instead of extra-time and penalty shoot-outs, perhaps they would like to use xG to determine the result of drawn (actual goals!) cup games? It would be almost impossible to have a drawn xG game, so we would always have a winner. What nonsense! Let’s not take this all too far! An interesting insight into performance? Perhaps, yes. Am I missing the point? Perhaps, yes. But let’s not get too carried away. Although if it was based on xG we wouldn’t actually be bottom of the league after two games! In June I wrote a series of articles based upon the International Football Association Board (IFAB) rule change proposals. Part 3 of my series looked at their ideas for increasing playing time, which revealed how they were considering dispensing with 45 minute halves in a game of football, and replacing it with two periods of thirty minutes, with the clock being stopped every time the ball went out of play. The purpose was to make the concept of time-wasting a thing of the past, as the clock would not be running unless the ball was in play. In my article I made reference to Tony Pulis bringing his Stoke City side to play at Upton Park in years gone by and how much time-wasting went on. 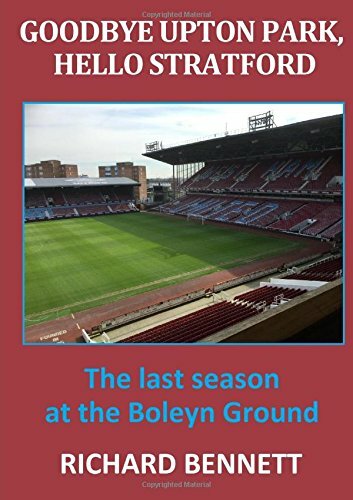 And in an article I wrote for the much missed fanzine, Over Land and Sea, in November 2015, and also in my book, Goodbye Upton Park, Hello Stratford, my review of West Ham v West Brom (managed by Tony Pulis!) on 29 November 2015 referred to my own timekeeping of the game when I watched it back in replay on Sky Plus. I timed the second half as around 25 minutes of actual playing time. So I had to smile when I read a piece on the BBC Sport website which referred to last weekend’s Burnley v West Brom match (you know the manager of the away side here!) which timed that the ball was in play for 47 minutes and 40 seconds in total! No game in the premier League has seen less action than this one. The fans are most definitely being short-changed in this respect. Apparently all the games in the Premier League this season have been timed and the ball was in play for more than an hour in just two of them. It’s about time the lawmakers took action and introduced this rule change immediately. It would be so simple. It would totally eliminate the whole concept of time-wasting. What is stopping it from happening? Can West Ham record their first league victory of the season? If we want to avoid the ignominy of still propping up the Premier League table by the end of the next round of matches we will have to significantly improve upon our performances at St James Park in recent times. Without delving back too far, just looking at our results there in the 21st century, we have played 13 games and won only once. That sole victory was courtesy of a Kevin Nolan goal in November 2012 in our first season back in the top flight under Sam Allardyce. Although that win was less than five years ago, it demonstrates the turnover of players at our club in that of the starting eleven, Reid, Carroll and Noble are the only three who are still at the club, and Collins is the only one of the seven substitutes still here. Being quite disheartened by our record in the present century, I looked back to the twentieth century and found little comfort when assessing our historical visits to the North-East. We first played a top flight away game at Newcastle in 1923, the year we played in the first Wembley FA Cup Final. But we didn’t manage a win up there until fifty years later in 1973 when Ted MacDougall netted twice in a 2-1 victory. One more win in the 1970s in 1977 was by the margin of 3-2 with our goals scored by Jennings, Taylor and Pop Robson. In our record breaking 1985-86 campaign we won 2-1 with goals from McAvennie and Cottee (who else? ), and our next win was 2-1 in 1989 when Keen and Ward hit the target. A 1-0 victory in the 1997-98 season came from a Stan Lazaridis goal, and we followed this up in the next season with our most emphatic win there, 3-0, with two goals from Ian Wright and another from Trevor Sinclair. In total we have won just seven league games at St James Park in around 50 attempts! Our last visit there was in January 2016, the season before last, when we conceded two goals in the first quarter of an hour, before Jelavic pulled a goal back early in the second half. We ended up losing 2-1 and Newcastle were relegated that season. In terms of Premier League status, the Geordies are a club on a similar level to ourselves, being one of the top ten clubs in terms of seasons spent in the top league. Only six clubs have been ever present in the top flight in the 25 years of its existence up to the end of last season, namely Manchester United, Arsenal, Chelsea, Liverpool, Tottenham and Everton. Aston Villa come next on 24, followed by Newcastle on 22, West Ham on 21, and Manchester City 20. In that time they have been more successful than us, in that their highest placed finish is 2nd (twice) (ours is 5th), and they have finished in the top four on five occasions, although the last of those was in 2003. Since then they have been relegated twice, but bounced back at the first attempt both times. Newcastle have made an equally ignominious start to ourselves, and in their first two games of the season they lost 2-0 at home to Tottenham, and then 1-0 at newly-promoted Huddersfield. So they have no points and have not scored a league goal this season. In addition they were dumped out of the EFL cup this week, losing 3-2 at home to Championship side Nottingham Forest. But beware! In their entire history, Newcastle have only once failed to score in their first three top flight games, and also Rafael Benitez has never lost three consecutive Premier League games as a manager in England. But on the plus side, Chicarito has scored three goals in his last four league games against Newcastle when he has started, and the one that we really hope will continue is that Joe Hart has never been on the losing side in 16 league games against them. The Sports Analytics Machine (SAM), the super-computer used to predict the outcome of football matches reckons that the game will end in a 1-1 draw. I am more hopeful, and the return of Lanzini, and the confidence of the team gained by our first win in midweek, will I believe lead to our first league win of the season, and only our eighth when visiting Newcastle. I’ll predict a 2-1 victory. The resistible force encounters the movable object in a bottom of the table clash at St James’ Park. I am not sure what the opposite of an irresistible force meeting an immovable object is but we may well find out at St James’ Park this afternoon as both sides strive to improve on their 100% losing starts to the season. Will the powder puff Newcastle attack overcome the wafer thin West Ham defence or will Geordie passion be extinguished by the Javier Hernandez get out of jail free card? To claim that this a relegation six pointer before the blackberries have ripened is premature in the extreme but the outcome of today’s game could play a major part in deciding the Premier League sack race; or more precisely who the first manager to leave his post will be. There is added intrigue in the form of persistent speculation linking Rafa Benitez as the next in line for the hot seat at West Ham. In a cruel twist of fate I ended up watching both of Newcastle’s opening Premier League fixtures live on TV. They were well beaten in the opener by a cruise control Tottenham with the Toon offering little once their initial enthusiasm had died down and Shelvey was deservedly sent-off. The follow-up uninspiring encounter with Huddersfield was a more even, but drab, affair which was decided by the game’s only real quality moment when Huddersfield’s Aaron Mooy scored the only goal of the game. There is clearly an air of smouldering doom surrounding Bentitez and his frustrations with player recruitment could result in a spontaneous eruption at any moment. Both teams were in EFL Cup action during the week and, whereas the Hammers came through unscathed with a competent performance against League Two Cheltenham, Newcastle were dumped out, after extra time, at home to Championship Nottingham Forest; albeit with a definite second string line-up. Whether West Ham will be buoyed by success or Newcastle humbled by defeat remains to be seen. Newcastle hold the edge in the all-time record between the two clubs having won 40% of the 129 meetings to West Ham’s 31%. In the last twelve encounters the Hammers have seen four wins, five defeats and three draws. It has been a much more one-sided affair for games at St James’ Park with West Ham having won only nine times (and lost thirty six ) out of sixty five attempts. In the last twelve away fixtures the solitary Hammers success was a 1-0 win, courtesy of a Kevin Nolan goal, in November 2012. Even the last two away meetings when Newcastle were battling for survival both ended in relatively comfortable victories for the hosts. Marko Arnautovic is suspended for West Ham but Winston Reid is the only senior player missing through injury. This means not only the potential return of Manuel Lanzini but also a phenomenon rarer than a total solar eclipse with both Andy Carroll and Diafra Sakho available for selection at the same time. Lanzini’s running and creativity have been sorely missed but he may have to settle for a place on the bench if deemed not yet ready to start. It would be a surprise if Carroll is included in the match-day squad but who knows; he has faced his old club in West Ham colours five times but has so far defied football convention by failing to score. Elsewhere Cheikhou Kouyate is set to return in a midfield where we will be able to assess the extent of Slaven Bilic’s marble lossage if he persists in selecting Mark Noble ahead of Pedro Obiang. In defence we should expect the return of seven goal Joe Hart between the sticks and to see 34 year old James Collins start in place of 34 year old Jose Fonte. Newcastle are without the injured Karl Darlow, DeAndre Yedlin, Paul Dummett and Florian Lejeune plus the suspended Shelvey. The Toon could see a welcome return for Dwight Gayle who must be one of the most ineffective strikers in the Premier League. Neil Swarbrick from Lancashire is today’s referee. Swarbrick had a full set when refereeing three West Ham home games last season that saw a win against Palace, a draw with Middlesbrough and defeat to Liverpool. This will be his second Premier League match of the season having previously officiated at the Everton v Stoke game on the opening weekend. BBC’s Lawro has gone for a 1-1 draw while Paul Merson has predicted a 2-0 win for the Hammers. I see a number scenarios for this one depending on what happens during Newcastle’s expected early surge. Whoever scores the opening goal will go on to win and provided that the Hammers do not get off to a typical slow start I can imagine a rare 1-0 victory to bring back from the north-east.